Nichole © Earring Angel Angel © Hanging Earring Holder Organizer with Shelf. Click on the Angelynn's Jewelry Organizers link to see more of our jewelry storage solutions. Handmade product 100% Made in the USA using skilled American tradesmen and high grade US materials. We use carbon steel and the very best baked on powdercoat finishes, no mystery metals or lead. We are a small boutique company and do not mass produce but instead offer smaller quantities with higher quality. Jewelry Holder Dimensions: Quite large at 22 inches tall x 14 1/2 inches wide and is offset from the wall by 2 1/2 inches. There is a 14 1/2 inch wide x 2 1/2 inch deep accessory tray/shelf on top, great for perfume bottles. 4 heavy-duty, easy to use Screw/Anchors are included that can be used on drywall, masonry, brick or plaster. Easy to install and use. Durable and sturdy and they will last a lifetime with proper use. 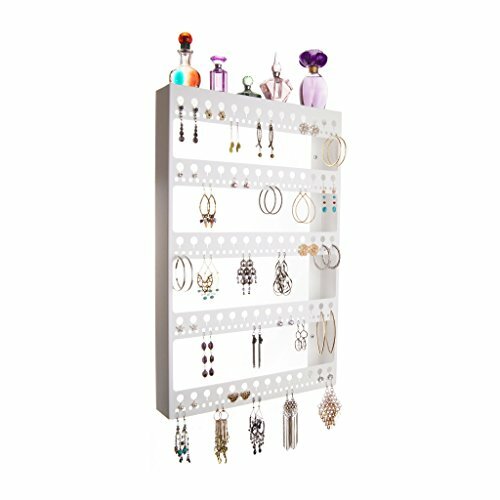 Wall mounted earring holder organizer storage capacity: Displays up to 105 pairs of earrings. Created for long dangle earrings and hoop earrings, however tiny stud earrings can hang on any keyhole. It can accommodate 2 1/2 inch to 5 inch hoops depending up the row. How to use: Attach the post back (if there is one), leaving a small space on the post. Place the back through the keyhole and let it slide down into the slot. It's that easy! For hoops open the earring, feed post through any hole and close. If there is no post back, just hang them. Many customers have purchased S hooks to hang on the bottom row of round holes to hold their necklaces and bracelets, turning this earring holder into a multi-purpose jewelry organizer. Jewelry boxes, armoires, chests, trays and drawers need de-cluttering? Our beautiful jewelry organizers, earring holders, bracelet racks and necklace stands hold a lot of jewelry for the space they occupy. They are a wonderful accessory for your bedroom, closet, dressing room or dorm room but they are also durable enough for commercial or retail use. They are a fabulous gift idea for women, teens and girls ages 4 and up. If you have any questions about this product by Angelynn's Jewelry Organizers, contact us by completing and submitting the form below. If you are looking for a specif part number, please include it with your message.